A dazzling showcase of this uniquely American art form! 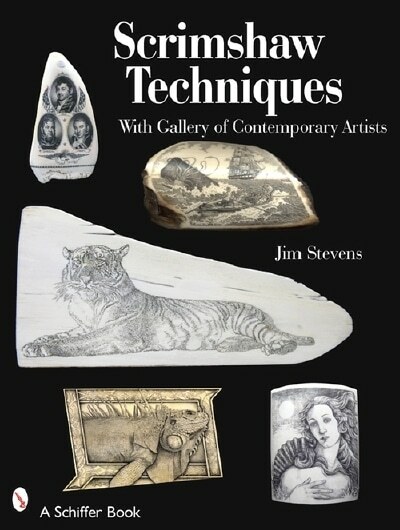 This 160-page book is filled with tips, techniques, and insights that both educate and demonstrate the steps to creating authentic and beautiful scrimshaw. Includes a gallery of works by contemporary artists. This step-by-step guide addresses scrimshaw tools, patterns, inking, inlays and a treasure of information not found in any other book. Originally written as a training manual for studio apprentices, this knowledge is now available to you. Over 200 color photos make learning a snap! Each book personally autographed by Jim Stevens. at the publisher’s list price of.